Older building, clean and accommodating. Overall good experience. Everything about the property was nice, except the driveway leading into the establishment. Way too many potholes! 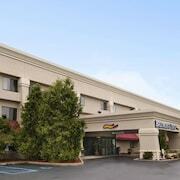 Where to find Battle Creek hotels near an airport? 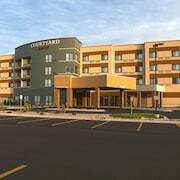 Where can I find hotels in Battle Creek that are near tourist attractions? With 15 Expedia-recommended hotels in Battle Creek, visitors here have a range of options. Just a short ride from Battle Creek's center you'll find 15 Expedia-listed places to stay. 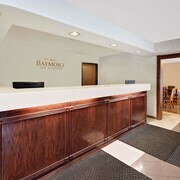 The Baymont Inn & Suites Battle Creek Downtown, is an ideal choice for travelers due to the fact that it's it is the most centrally located accommodation option in Battle Creek. The Battle Creek area has a solid selection of budget hotel options that will satisfy even the most budget-minded vacationers and travelers. 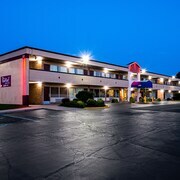 The Baymont Inn & Suites Battle Creek Downtown is 0.6 kilometres (0.4 miles) from the center of Battle Creek, while the Red Roof Inn & Suites Battle Creek is 7 kilometres (4 miles) away. Two more options in the cheaper range include the Econo Lodge Battle Creek and the Travelodge Battle Creek. 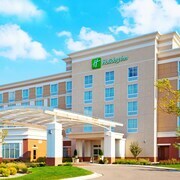 You could check out the Holiday Inn Battle Creek or the Fairfield Inn by Marriott Battle Creek. 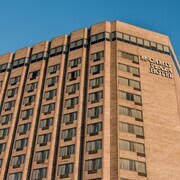 The Holiday Inn Battle Creek is positioned 6 kilometres (4 miles) from downtown Battle Creek. 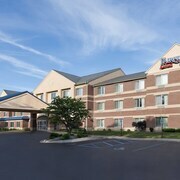 The Fairfield Inn by Marriott Battle Creek, is located 7 kilometres (4 miles) away. Alternative options include the Hampton Inn Battle Creek and the Hampton Inn Marshall. Like to go a little further afield? Southwest Michigan has many attractions. Spend time at Southwest Michigan's art galleries. Lovers of nature could also take the time to admire its forests. Popular things to do in this part of United States of America include cycling and shore fishing. Looking for more to do? Consider spending a day or two visiting Regent Theatre and Griswold Auditorium, in Allegan, 60 kilometres (38 miles) to the west of Battle Creek. Allegan hotels and accommodations are the Delano Mansion Inn and Allegan Budget Host Inn. Alternatively, you could stay in Hastings, 40 kilometres (24 miles) to the north of Battle Creek, where you can choose from the Holiday Inn Express Hastings and Parkview Motel. If you're staying in Hastings, be sure to check out the Fish Hatchery Park and Tyden Park. 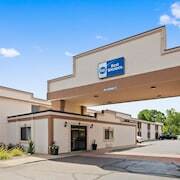 If you are planning on flying through Kalamazoo-Battle Creek International Airport, you may like to stay at Residence Inn by Marriott Kalamazoo East, or Courtyard Kalamazoo Portage, which are both nearby. What are the most popular Battle Creek hotels? Are there hotels in other cities near Battle Creek? What other types of accommodations are available in Battle Creek? Explore Battle Creek with Expedia.ca’s Travel Guides to find the best flights, cars, holiday packages and more!